Mexican folk culture and traditions are reflected in several ways: social, cultural, and its manufacturing processes are not the exception. 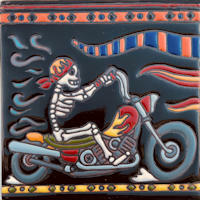 Mexican folk art is expressed in clay tile in the form of day-of-the-dead raised paintings made on clay. We are proud to present you this form or art. 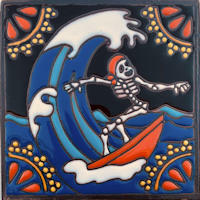 To view more details about a particular day-of-the-deay clay tile near me, just click on the corresponding image. A full set of detailed images will be displayed along its description and in stock notice. L: 6", W: 6", H: 0.35"